Tonight I’m back in Covent Garden trying out a brand new bistro. I seem to keep discovering romantic stories of family businesses that have been going forever. PAUL is another one of them. The company was started in 1889 when Charlemagne Mayot and his wife opened a small bakery in Croix near Lille. It was his granddaughter Suzanne and her husband who carried on the business by taking over a famous bakery-patisserie in Lille belonging to the Paul family. They decided to keep the name. PAUL patisseries are now in 29 countries around the world and 125 years later, what has now become something of an empire, is still family owned and run. I’ve had many PAUL encounters in London. It’s hard to walk past one with their tempting array of cakes twinkling at you from the display. And their coffee’s really good, too. Tonight’s PAUL, though, is one with a difference. Behind the irresistible confectionary is their first foray into the world of restaurants – a classic bistro. 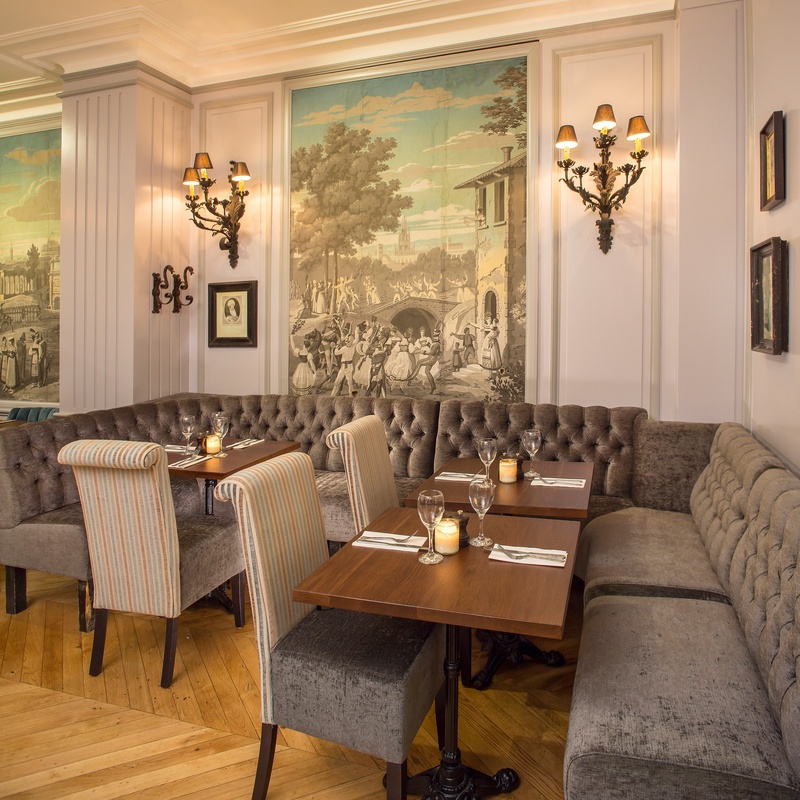 With beautifully Parisian decor and a menu based on classic, simple French cuisine, there’s no doubting its French-ness. And the food is wonderful…it’s easy doing simple food, but it’s not always easy doing it to perfection. They’ve certainly achieved that here. The conundrum of picking a starter was neatly averted by going for a platter! A rather carniverous one at that. 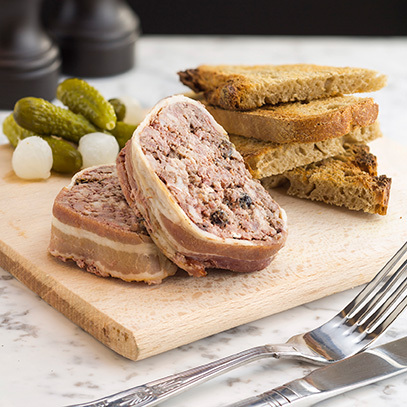 This selection of saucisson, jambon cru, coppa, rosette, terrine and smoked duck breast came scattered with zesty onions and cornichons with a basket of assorted bread on the side. They take their bread very seriously here, it’s all made on-site with flour that’s milled from wheat grown exclusively for them by French farmers. No wonder it tastes so good. This meaty combo was amazing. 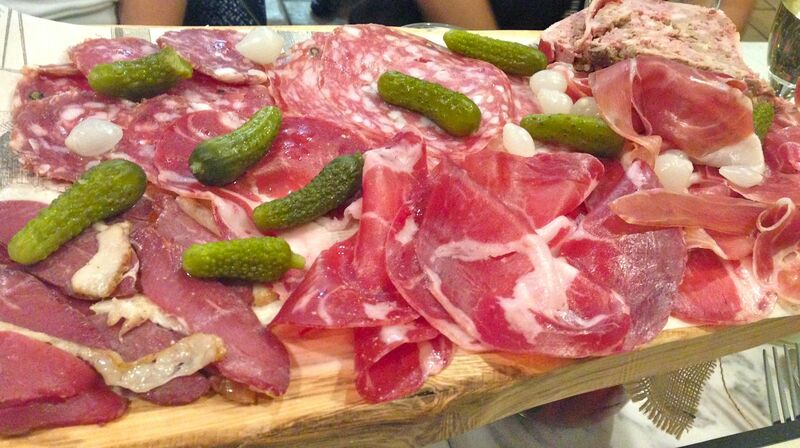 I particularly like the saucisson and smoked duck and could have eaten a whole tin of the pate de Campagne. It was ridiculously good! 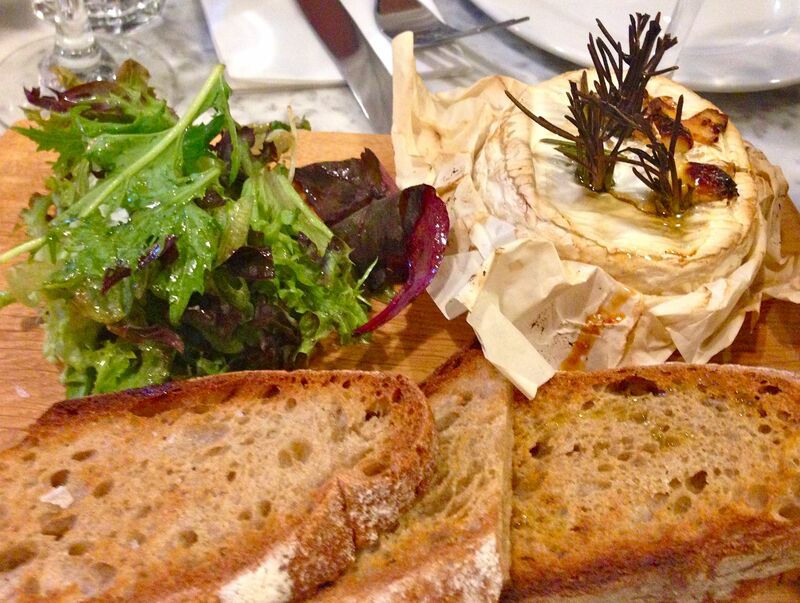 The petit Camembert came with toasted Campagne bread. A starter to share and get stuck into…dipping the toast into the creamy ooziness of the camembert is wonderful, if potentially messy! The main course options (not surprisingly) shout France! Things like blanquette de veau, Toulouse sausages, Andouilette, Coq Au Vin and steak frites. After a discussion about whether it was boring to order roast chicken in a restaurant (yes is the answer) I decided to try their roasted free range corn fed half chicken, marinated in tarragon, lemon and garlic. Beautifully lemony with a hint of scented tarragon, this strikingly yellow (from the corn) chicken was mouthwateringly succulent and could certainly be entered into a competition for the best roast chicken ever! And it was huge…well, they did say half a chicken so I don’t know why I was surprised at the size…seriously, this is a main for two to share, especially when you consider all the other delicious dishes you are going to be unable to resist! 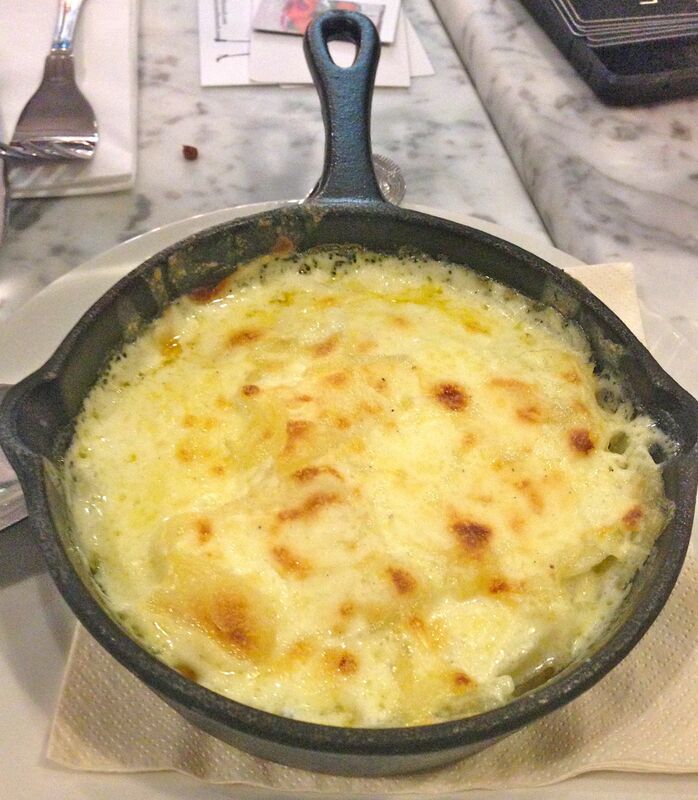 Like the dauphinois potatoes…yummy, yummy, yummy. Love the little pan, too. 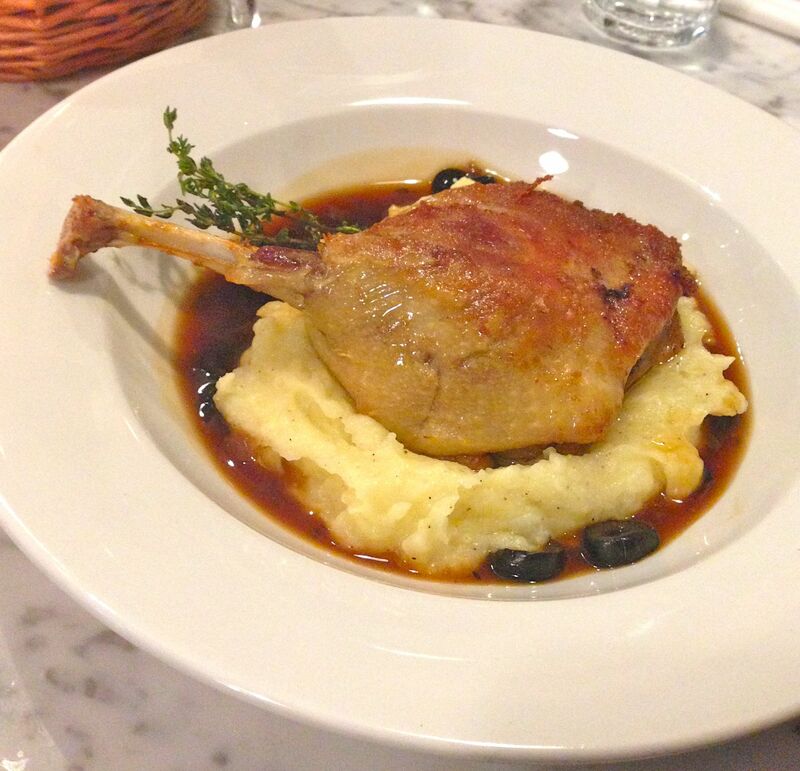 Another classic is the duck confit, a slow- cooked duck leg served on buttery mash. Crispy, soft and flavourful, this has got to be one of the best ways to eat duck. There’s a great selection of wines, as you’d expect from any class French establishment. The breakfast and snack menus look extremely tempting, too. Who can resist a croque monsieur, or madame for that matter. And then there’s the desserts. A range of tarts to start with – the lemon (citron) is truly scrumptions (I’m running out of adjectives!) 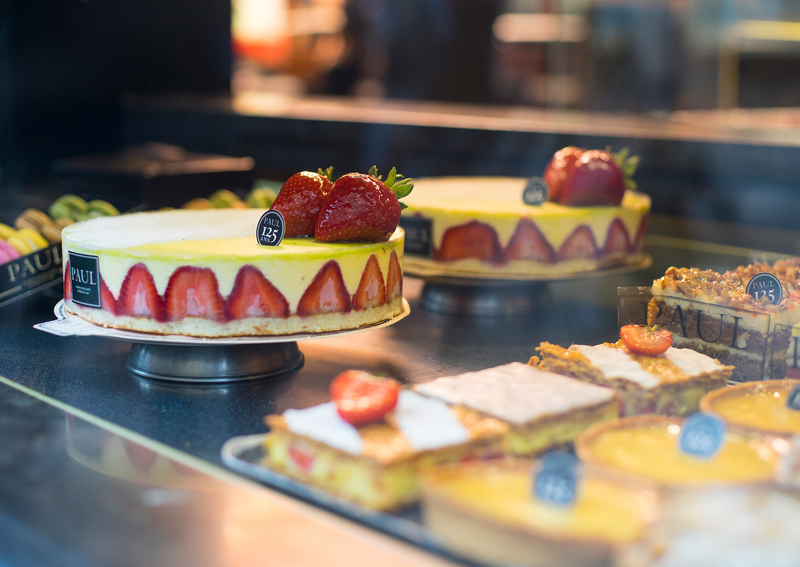 or you can sample millefeuille, eclairs, macarons, brioche-based delicacies and sorbets and ice creams. PAUL had only been open about a month when I visited. The strangest thing about it (in a good way) is that it feels like it’s been around forever and you are eating classic family recipes that have been passed down through the generations. The space is stylish and comfortable, the staff serve with a twinkle in their eyes and it’s also extremely good value. For example, my jumbo helping of chicken costs £12.50. 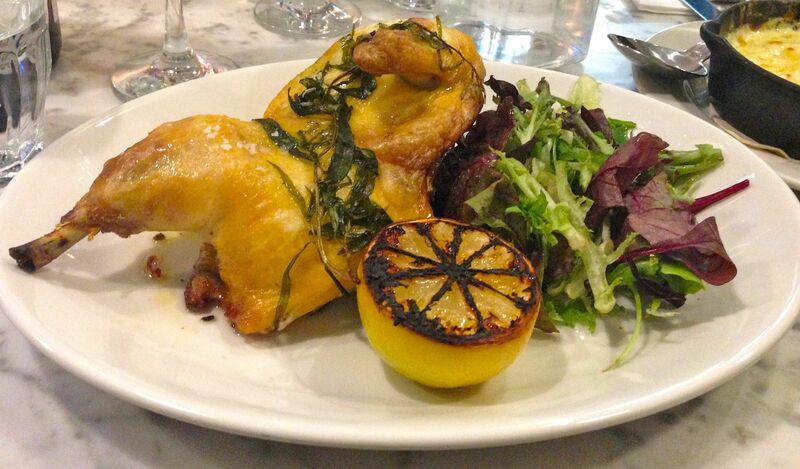 A great new addition to the Covent Garden restaurant scene, as well as to the family business. Welcome La Restaurant de PAUL.